Experience our luxury domed railcars traveling roundtrip from Anchorage. Enjoy dinner and a show at the Music of Denali Dinner Theater at McKinley Chalet Resort featuring family-style dining and a spirited original musical about the first men to reach the summit of Denali. With 2 nights at Denali National Park, and 2 nights at Mt. McKinley Princess Wilderness Lodge there’s ample time to explore all the culture, wildlife and scenery that make Denali so special. 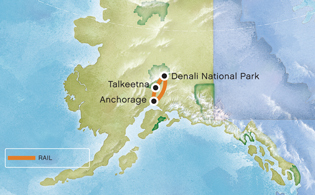 Enjoy Denali's south side and explore Denali State Park and Talkeetna.